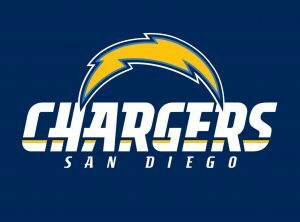 The San Diego Chargers were linked with the Oakland Raiders in a proposed move to Los Angeles (see Are the Raiders Moving?). That proposed move was outvoted by the NFL membership in favour of The Rams moving back to LA and building a new stadium at Inglewood, leaving both The Raiders and The Chargers to look for new or improved homes elsewhere. Both teams have been asking local authorities for funds to build new stadia, and have been looking at moves away. Most notably this entire site is dedicated to the Raiders proposed move to Vegas. The Chargers hopes of a new, improved stadium in San Diego took a hit early in November 2016 when a ballot called ‘Measure C’, run by the Chargers and questioning 110,000 local inhabitants, failed to get a two-thirds majority. Indeed, it was defeated 57% to 43%. This is important for the Raiders because the Chargers were given one year to exercise an option to join the Rams in Inglewood in 2019. If they do not exercise that option, it transfers to The Raiders.